Posted on January 18, 2014 by Sarah @ Celiac in the City •	This entry was posted in Recipes: let's eat! and tagged Celiac in the City, gluten free recipe, how to cook a spaghetti squash, lasagna stuffed spaghetti squash, spaghetti squash recipe, squash recipe, stuffed spaghetti squash. Bookmark the permalink. Would anyone know if this can be frozen? Hi, Ann! I have never frozen it after making, but my mom has frozen just the spaghetti squash after roasting it and forking it out of the shell. She then made it as more of a casserole, just layering the ingredients like more of a lasagna. If you do end up freezing the whole thing and then reheating it, please let us know! I do a spaghetti squash as a casserole dish, make it the day before and also do up extra and freeze. You can put anything in it ie: spicy red pepper tomatoes, onions, parsley cheese etc. Leftovers are also great. Do you know the nutritional information on this recipe, like how many carbs , calories , etc? Btw I just made this for my family and we all loved it! Sorry, Montana, I don’t have that specific info. But there are several apps or sites where you can punch in exactly what you had in a recipe and then it will calculate by servings. So glad you enjoyed it, it’s a crowd pleaser for sure! Can you prepare the squash the day before? We usually serve at least part of it right away, but there are always leftovers! So I’m sure serving the next day is fine. You could always add an extra layer of cheese on top and get it all melty! I made it the day before to save time. It turned out great and ate leftovers for another two day. made this for dinner tonight. OMG. SO GOOD! Thank you! I shared with a friend who’s a sous chef in Baltimore. This is delicious! I’m so glad I have another half left for another day! So glad to hear that, Sherrie! Thanks for stopping by to let me know, made my day!!! Did you not use any of the squash you scooped out? I didn’t see it in your steps when stuffing it. Thanks! I just saw my question (and have my answer) in the comments below. Glad I wasn’t alone in the confusion 😉 I’m making this tonight! This was awesome! My husband is a diabetic and on a low sodium cardiac diet so I changed out the sausage for lean ground beef and seasoned with salt free Italian spices (mrs dash Italian blend). I also used low sodium ricotta. I arranged the layers as suggested incorporating the scooped out squash as one of the layers. We couldn’t eat it all. We didn’t miss the salt at all. This is definitely a keeper!! Thank you!! Hello– How many would you say this serves? Would 1 squash be for 2 adults? Bethany — absolutely! We had it for at least two meals. Enjoy! This was delish! Next time I make this (actually, when I assemble the second half… my husband and I could only eat a quarter of the squash each!) 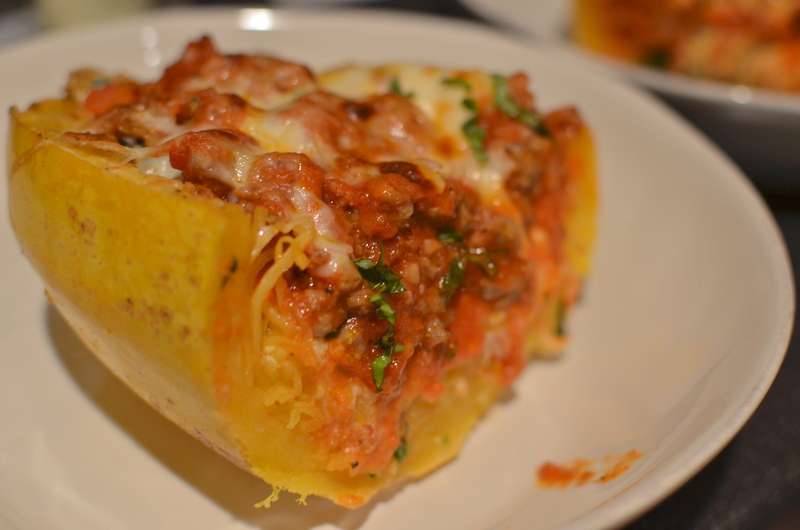 I will scoop out some of the spaghetti squash and incorporate it into the “lasagna layers”. I think this will make it easier to eat… we ended up mixing the layers with the squash at the bottom with the original way of assembling. oh my gosh! i made this yesterday for myself while i made the hubby and my brother the real lasagna. the only change i made was putting in 1/2 lb. of ground turkey and 1/2 ground italian sausage. it was sooooooo goood! I’m so glad i found this recipe! thanks! Do you cook the squash cut side down in the water? I didn’t see that in instructions. You got it, cut side down. (but either way would work) Enjoy! I have made this a few times and forwarded this recipe to friends and family. My absolute favorite recipe with spaghetti squash. I’ve made it on a week night (while squash is baking, start prepping mixtures). Super YUMMY!! Yummy! Will make it again! Very easy, especially a jar of sauce. Yum! This looks amazing! 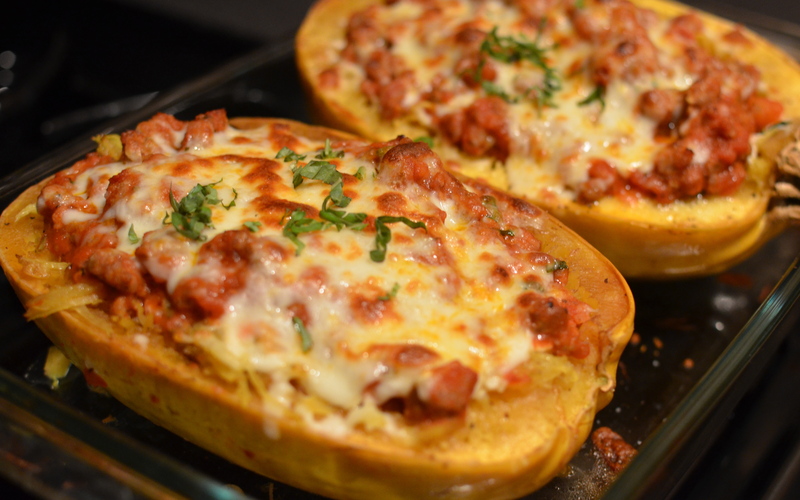 My husband doesn’t like spaghetti squash, but I bet he’ll like this recipe! So you don’t mix the squash “noodles” into the filling? They are served separately? Making this for supper tomorrow night! I cant wait! After you have scraped the noodles, is it going to look like a bowl of noodles and then you fill the squash with noodles sitting in the center? sorry a little confused I want to make this for my family. It does kind of look like a “bowl of noodles” when you’re done scraping — I mixed some of the filling right in with the “noodles” and then stuffed the rest on top. enjoy! Wow! I was never a big fan of spagetti squash, but thus recipe changed that! It was delicious! I used 28oz. You may have extra sauce depending on squash size and how much sauce you prefer. Often when I have extra I dump it over anyway and then more cheese 😉 or save for another dish. Do you usually stringify [a completely made up term haha] your spaghetti squash before filling it? Or do you just kind of do that as you go? This looks so yummy, I’m sure my husband would approve! Nevermind, I missed a sentence in your instructions! Question answered! Hi Amanda! Love when readers can come back and answer their own questions. 😉 How did it turn out? Made this tonight for dinner- yummy!! I used fire roasted tomatoes to make my sauce- perfection !! This looks delicious! 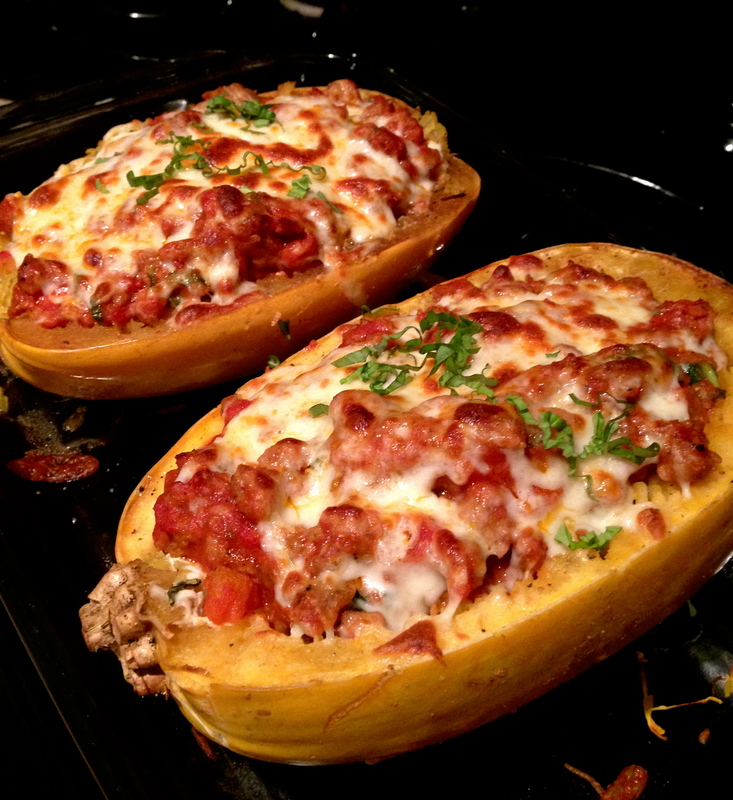 I’ve been looking for a reason to eat some spaghetti squash lately – this is it!! Hi Sarah, I found your blog today through a link from your newspaper interview, while looking for a recipe for a GF cornmeal cake … how’s that for indirect? And I thought I would answer your question about eating GF in Italy … it’s everything you have ever heard, and more … so easy! There is a higher percentage of Celiacs in Italy than in most other countries, and virtually any/every restaurant is prepared to accommodate your GF diet, with extremely delicious foods. Some are naturally gluten free, and others use gluten free pastas, breads, etc. Even the smallest mom and pop restaurants — and gelato stands, chocolate stores, pizzerias, etc. — will happily feed you well, even if they do not have an official gluten free menu, and even if they do not speak English. Simply say “Io sono celiaco” (I am Celiac) or “senza glutine” (no gluten), and you will be greeted by smiling faces who will either point out what you can safely eat, and/or will make something special just for you (for example, you might end up with a platter of GF sausages and cheeses served with salad, or they might make you a special risotto or a quiche with a risotto crust). Another option when dining it Italy is to bring your own box of GF pasta to a restaurant with you (available in grocery stores and drug stores), and they will cook it and serve it with any of their GF sauces, in fresh water to avoid cross contamination. I have rambled long enough, lol, but I will be back to visit often, and will let you know when my own GF blog is finally online. Warmest wishes for a happy healthy year! wow, that looks pretty fantastic! I love this idea.